HAPPINESS IS JUST AROUND THE CORNER !! ARE WE THERE YET? ORLANDO 2019! WE LOVE OUR VACATION HOME! And we hope you will LOVE it as much as we do. We offer a very bright, clean, comfortable, spacious, well maintained, family oriented vacation home to help families create memories to last a life time! Great for 2 families to share making it an economically feasible vacation. BBQ grill, fully stocked kitchen with amenities for cooking, large private pool with lanai seating for 6 and 4 loungers, 2 livingroom areas, 3 eating areas, 6 TV's, vaulted ceilings, sunny south backyard, golf community and 2 sets of clubs available to use, close to Disney World, shopping, restaurants, mini golf, Universal Studios, Sea World, Busch Gardens, Gulf of Mexico, Nasa. RELAX, RESTORE, REJUVINATE! ORLANDO! Your vacation destination! We use our vacation home all the time so we've gone to great lengths to CREATE A HOME NOT JUST ANOTHER VACATION RENTAL. This renovated (brand new carpet November 2017), modern, privately owned 4 bedroom, 2 bathroom vacation home boasts 2050 sq.ft. of living space. 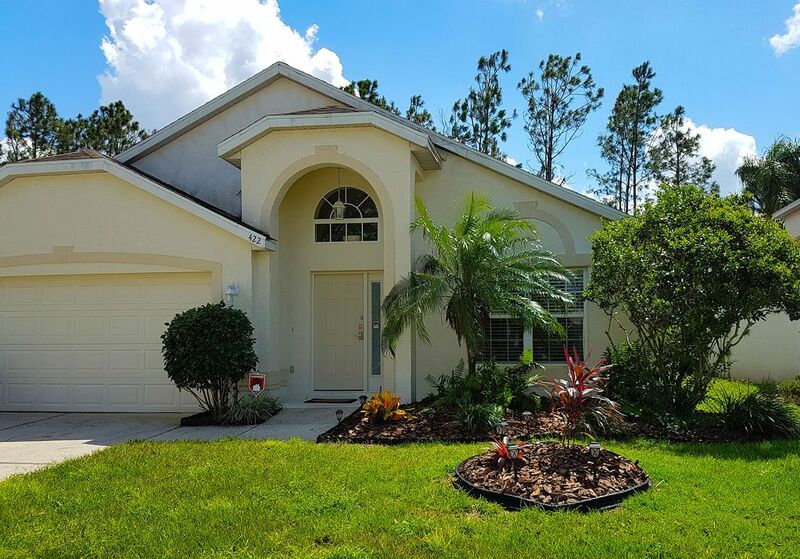 Our Villa is located in the prestigious Highlands Reserve Golf Course Community and is only a 15 minute drive to Disney's Theme Parks and a 1 hour drive to each coastline. Highlands Reserve has an award winning 18-hole golf course you can walk to and is set amongst beautiful homes, rolling hills and orange groves. Our home has its own private, south facing screened in pool backing onto a natural conservation. It has a beautiful eating area with large table, seating for 6, privacy screen and BBQ Grill to use throughout your stay. You can enjoy sun filled days lounging on the deck or swimming in the pool while experiencing total peace and privacy. Our self catered home is exceptionally clean and bright and has a well laid out floor plan, with plenty of space to relax. It is equipped with all the amenities you would expect to find to make your stay comfortable, relaxing and carefree! Come stay at your Home Away From Home! GUEST REVIEWS ARE GREAT WITH MANY REPEAT GUESTS AND RECOMMENDATIONS. Our Villa: This beautifully appointed 4 bdrm/2 bthrm villa is located in Prestigious Highlands Reserve Golf Community with club house, pro shop and snack bar. The villa's private, enclosed pool faces south offering sun all day on the deck. There is a community pool, tennis courts and playground for your use during your stay as well. The large family room and master bedroom have direct access to the pool deck via sliding doors. The spacious kitchen is equipped with all the amenities you will need to make use of the kitchen for each meal. This will save you 100's of dollars on eating out. The Family room has a 55" Smart HDTV TV/Cable/DVD player and the living room has a 50" TV with PS2. The sliding doors to the pool deck are equipped with a child proof alarm. All other rooms are equipped with a TV/cable and ceiling fan to keep the air conditioned rooms even cooler on those hot nights. Laundry room is located inside just off the garage, available for your use during your stay. Pool Heat: Pool heat is required October through April. When you receive a quote from Home Away, the home owner will add pool heat to the quoted cost. It is not included in the quote from Home Away. Bedrooms and Bathrooms: The large Master Bedroom has a 4 piece en-suite with soaker tub, walk in shower, dual sinks and separate toilet area. There is a large walk in closet, dresser, night stands, chairs and side table for dressing and sliding glass doors to the pool deck. The vaulted ceilings in this room give it an open and airy feeling complimented by a ceiling fan and TV/cable/phone. The 2nd bedroom has a queen bed, dresser, vaulted ceilings and ceiling fan, TV/cable/phone and access to the second bathroom right beside it. Bedroom 3 has a double bed and a single bed allowing sleeping accommodations for 3 in this room and bedroom 4 has 2 single beds. Both rooms have dressers, ceiling fans and Cable TV with access from the second hallway to the bathroom. They are large spacious rooms allowing the guests to unwind and relax at the end of the day watching TV or reading a good book. Amenities: Disney World Theme Parks and Downtown Disney are just a short 15 minute drive from the villa via the I-4 highway. 30 minutes from the villa you can go to Universal Studios, Sea World and International Drive. You are a 60 min drive to each coast line to visit tourist attractions like Clearwater Beach, St.Pete's, Busch Gardens, Kennedy Space Center, Daytona Beach, Daytona Nascar Raceway. There are 11 major shopping malls within easy driving distance, a Publix Supermarket for your grocery needs only 2 min away, Walmart and Outlet Shopping offering discounts of up to 80% off. Regal Palms located across the street from Highlands Reserve offers a full day spa for various beauty treatments, massage and facials. Co-owned by 2 Canadian Brothers and their families. This is our vacation property to enjoy year round and share with our family, friends and guests, YOU! We have made many improvements in our home since we purchased it in 2008 and we continue to do so every time we are at our home. We've updated furniture, fixtures, lighting, flooring, linens, and pool/deck furniture for everyone to enjoy. Between our two families, one lives in Eastern Canada and one in Western Canada, we spend about 7 weeks a year in the sun, relaxing and enjoying much needed family time with our kids. We have not gone overboard in our decorating since we have such a variety of people using the house. Florida is not just about Disney. There are so many things to experience and we try something new every time we are down for a holiday. Just our community alone offers you 18 holes of golf professionally designed and challenging for the avid golfer. Our home is a HOME, NOT JUST ANOTHER VACATION RENTAL. It is truly a comfortable, clean, well maintained, well equipped vacation home. It's a place you can settle back and relax, all day by the pool if you like or to come back to after a long day at the theme parks. You can put your feet up, have a glass of wine by the pool, watch TV, read a book, all in quiet and comfort. With a south facing pool/back yard and beautiful deck with table, chairs and loungers, there's space for everyone to unwind, chill and relax. Super quiet neighbors on either side and no one behind. A stay here will convince you to never stay in a hotel again, not when there is the option for an entire home. You just can't beat it. When we bought the house, the first thing we noticed compared to so many other homes we'd stayed in or looked to purchase, was the difference in size. Our home had such a great floor plan, all on one level, it was wide open, bright and inviting. But it lacked color and warmth. We started by removing all the carpet in the living areas (except the bedrooms) and had tile laid throughout. This helps in the hot summer days to cool the house down. We then added color through curtains, new light fixtures, new art work, pillows, new bedspreads and furniture, flat screen tv's, etc. It felt like home. We have before an after pictures and it's hard to believe it's the same house. We loved the location. Highlands Reserve is a great community in comparison to so many around. It's well manicured lawns and higher end homes in addition to the Golf Course, Tennis courts and community pool make it an attractive alternative to other communities. It's location to Disney was perfect. You can avoid the I-192 and all it's traffic, lights and people, and take the I-4 to exit 67 in about 15 minutes. This takes you right to all the Disney Parks and Downtown Disney hassle free. We also loved that we could be on the road to the Gulf of Mexico in 5 minutes, and be in Tampa in 45 or Clearwater in an hour. We love to drive there for a day at the beach, to take a dinner cruise or just walk along the beach to collect shells. It's an easy, relaxing drive in a day. The Master En-Suite is a bright spacious room with a soaker tub in the corner next to a large walk in shower. There are dual sinks in the vanity with a well lit large mirror and a built in blow dryer so you don't have to bring one. The toilet is in it's own separate room. There is tiled flooring in the Master Bedroom bathroom. The second bathroom has two entrance doors from two different hallways for the remaining three bedrooms to access. There are two sinks in the well lit, large vanity/mirror, tub/shower combo, blow dryer provided. Stocked linen closet is located inside the second bathroom. New air conditioner keeps the house cool in the warm summer months. Be sure to keep all doors closed while the air conditioner is running so it is effective. The house is equipped with FREE wireless Internet connection and flat screen TV's with cable in all rooms. Guests may use the telephone to make free local calls as well as unlimited long distance calls to anywhere in Canada or the US. Please inquire for Long Distance calls outside of North America. The bungalow layout allows for easy access for wheelchair capability as well as tiling in the main living areas for easy movement through the villa. All towels and linens are provided although we do ask that no linens be removed from the house. The living room and dining room areas are set up for the kids where there is 50" TV/Cable/DVD player, PS2 with loads of games, movies, DVDs, board games and books, while the adults enjoy the family room with it's large 55" HDTV/surround sound system. We had so much fun in Orlando and having a beautiful house to go home to after long days at Disneyworld was wonderful. It was nice to have a kitchen to make meals in instead of always eating out and the private heated pool was the icing on the cake. This house was spotless and has a very homey and comfortable feeling. Thank you so much for your kind review. It was so much fun to host you for your holiday to Orlando and to hear about the great time you had. I am so glad that our home was suitable for your trip and you were able to find a bit of time to enjoy the pool. It's always busy in Orlando with so many things to do and after a long day at the parks, you just want to wind down and relax before you tackle another day. We loved hosting you and hope we can again in the future so you can explore more of Orlando and the 1000's of things to do there. Really nice house!! I love it!! I am so pleased to hear you enjoyed your holiday in Orlando and our home was a part of a wonderful vacation for you and your family. We always love to hear from our guests and more importantly that they had a great time and our home meet their expectations. Florida is a great place to visit and have a lot of fun! It sounds like your whole family did just that! Thank you for being such a great family to host in our home and we hope to host you again sometime in the future. There are so many things to see and do in Orlando, one trip is never enough. We stayed in June 2018 for 10 days. It was a great stay at a reasonable price! The house was very clean and the pool was wonderful to come back to after a long day. The bathrooms were well stocked with towels for everyone, the kitchen was well stocked with everything you would need for cooking, they even had beach chairs that we could use to take to the beach. We loved having 2 living rooms where the kids could lounge out and watch whatever they wanted with no fighting. We only had 2 very minor issues. The first one was that the refrigerator was turned up way too high and it froze everything in it (lettuce, tomatoes, fruit, etc.) which we had to throw away and buy more. We turned it down and didn't have a problem afterwards. Next was that the outside grill on the patio only has half the burners working so it took extra time to grill everything. Other than those 2 very minor things, our stay was wonderful and I would recommend it to anyone!! Thank you for your review and comments. We are glad you had a great time in Florida and your feedback is very much appreciated. It is only through our guests feedback that we can improve our home and our guests experience. We have contacted our property manager who will ensure that when the cleaners clean the fridge out after a guest departs, they don't accidently turn down the fridge temperature button, as I'm guessing that's what happened. As for the BBQ, we will be replacing it with a brand new BBQ this week. So sorry that only half the burners worked. It was working when we were down in April but it sounds like it's time to replace it, we hadn't heard anything until now so I'm guessing the burners stopped working recently. Unfortunately because the BBQ is guest monitored or by us the owner when we're down at our home, our property manager would not have known only half the burners were working until a guest mentioned it to us or our property manager so I really appreciate you letting us know so we can get it replaced quickly. Have a great rest of your summer and it was a pleasure hosting your family for your holiday! My family and I stayed at this home from March 30 until April 6. Everything about this home was perfect, from the inviting decor to the awesome pool. We enjoyed the fact that were was more than enough room for the 5 of us that stayed here. The house is nice and close to the Disney parks and the neighborhood was very nice and quiet. Thank you to the owners. Thank you so much for your review on our home. We are so glad you had a great trip for your first time at Disneyworld with your family. I know you've created some memories to last a lifetime. Thanks for taking such good care of the house, you were a great guest. I hope we can host you again in the future. There's lots to do and see in Orlando and the coast lines, too much for one trip. An excellent apartment with all necessary equipment needed. Good Pool also added to the Grand-Childrens excitement. Only downside was that a light bulb had been broken and small pieces were accidentally left on the bed cover and my Granddaughter cut her hand when accessing. Would stay here again as walking distance to Town Centre and beaches. Hi Alastair, I'm not sure this review is for our home as it's not an apartment rather an individual home located in a community in Davenport Floroda and we are not located or within walking distance to any beaches what so ever. The closest beach is over an hour away in Tampa area and we are also not in walking distance to any any town centre. Perhaps this review is for somewhere else you stayed on your trip. The review simply doesn't seem to line up with our home description. I loved every minute of my vacation. I usually stay in Davenpor. However, this home had all the amenities to make our stay more enjoyable. Although it rained a lot which hindered our use of the pool, getting up early and just lying the chairs was more than relaxing. I would highly recommend staying here. Located only 15 minutes from Disney's Main Gate and 1 hour from either coastline and located in a golfing community, this vacation property has everything you could ask for. It's private south facing pool backs onto a conservation area, relax at the pool and enjoy sun all day long. Whether you are relaxing after a day golf, a busy day at Disney or just getting away from your day-to-day grind, relax and soak up some warm Florida sun. For the sporting enthusiast there is Daytona speedway, professional football, basketball, hockey, baseball, spring training, Petty racing experience and many golf courses from amateur to pro, all within an hours drive. For families there is an endless amount of activities within minutes of the villa. 5 Disney parks and 2 Disney water parks are just 15 minutes away, Universal studios, Sea World, International Drive, mini-golf... the list is endless. For the shopper there are dozens of malls from high-end to discount to outlet all minutes away! Golf: Highlands Reserve Golf Course is a professionally designed 18 hole course, set at the highest altitude in the Orlando area. Green fees vary throughout different times of the day and cart rentals are included in your green fees. There is a driving range, golf club rentals available, lessons, a pro-shop and snack bar. The clubhouse is a 8 minute walk from the villa and located across from the community pool/tennis courts/playground. It is open to the public but books quickly, especially after 3:00 p.m. Be sure to book tee times in advance. Damage Deposit - Home Away charges a flat rate of $59.00 non refundable damage insurance charge - this rate will be added in the quote - this eliminates the need for collecting a damage deposit Pool heat is needed during the months of October through April. The cost of pool heat is not included in the rate quoted for the nightly/weekly/monthly stay. This will be quoted in addition to the quote provided. Please check the quote attached to the response to your inquiry. The cleaning fee is charged for each booking at a rate of $95.00 Cancellation policy; We understand that things happen and cancellation may be necessary. We assess each individual case based on the circumstances and time line. We will always try to be as flexible as possible for our guest. The guidelines below are just that, guidelines and can be altered to accommodate the situation. a)	The following cancellation charges will apply to all rentals cancelled: •	More than 5 months prior to check in date – 100% refund of all deposits made less a $25.00 processing fee and any Pay Pal fees covered by the owner or fees that Home Away may charge. •	Between 91 – 120 days of check-in date – 50% of the deposit refunded •	36 – 90 days – 25% of the deposit amount refunded •	Within 35 days – loss of 100% of rental b)	In the unlikely event that circumstances beyond our control necessitate the cancellation of this Short Term Rental Agreement, we reserve the right to cancel any bookings at any time and will only be liable to refund monies already paid by the RENTER.